Honey badgers are not listed on the International Red Data List (IUCN 2001) but they are listed on Appendix III of CITES in Botswana and Ghana. 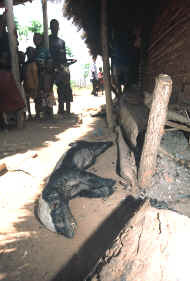 A species is included on Appendix III at the request of a Party that already regulates trade in the species and that needs the cooperation of other countries to prevent unsustainable or illegal exploitation (CITES 2004). International trade in specimens of species listed in this Appendix is allowed only on presentation of the appropriate permits or certificates. 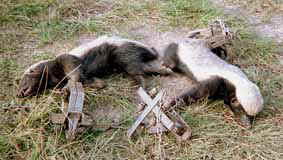 Honey badger are also listed as Near Threatened in the most recent South African Red Data List (2002). In the Cape provinces of South Africa, badgers are a schedule 2 protected wild animal (Nature & Environmental Conservation Ordinance, 1974; a permit is required to kill or move honey badger), but they are essentially unprotected outside of game reserves and national parks in other provinces of South Africa (Rowe-Rowe 1992). In the Western Cape South Africa half of 82 commercial beekeepers surveyed admitted to killing honey badgers despite their protected status (Begg 2001a). In Morocco, honey badgers are protected by law and the species is considered Near Threatened due to the non selective use of poison and traps. In Niger the honey badger is said to be Endangered and in Saudi Arabia they are considered to be rare. In India the honey badger is listed in Schedule I, Part I of the Indian Wildlife (Protection) Act, 1972. Little information is available from other areas. If you have any information, please contact us with the details. Badgers are particularly difficult to locate during conventional mammal surveys and, as a result, only coarse estimates are available of their distribution and abundance. Their relatively small size, frequently solitary and nocturnal behaviour make them difficult to record even in areas where they are well represented. In the southern Kalahari and Mana Pools National Park conventional survey techniques (spotlight counts and day transects) were poor indicators of honey badger density (pers. obs.). However, using these techniques Waser (1980) estimated honey badger density in the Serengeti National Park (Tanzania) as <0.1 individuals per square kilometer and, after 106 hours (1419km) of night driving in the Niokolo-Koba National Park (Senegal), Sillero-Zubiri & Marino (1997) estimated the badger density to be 0.07 per hundred kilometers (or 0.01 per hour). In the Hluhluwe and Umfolozi Game Reserves (South Africa) Whateley & Brooks (1985) recorded only two sightings in 3381km of night counts. In addition, badgers are not often dazzled by vehicle headlights or killed on roads (pers. obs.). Siegfried (1965) recorded only 3 instances of badger road mortalities from a total 3,306 mammal casualties in the Cape Province. As could be expected 70% of all these mammals killed were nocturnal species. Recent improvements in camera trapping tehcniques offer the best chance of surveying the density of honey badgers. This has not yet been done. Due to their large space requirements, viable populations of honey badgers are unlikely to be contained within the smaller protected areas. Their biological features of a small litter size (1-2 cubs) and an extended period of dependence on their mothers may make honey badgers particularly vulnerable to local extinctions in unprotected areas where there is ongoing persecution and conflict with beekeepers and farmers. In addition their elusive nature means that honey badger populations could easily reach critically low levels without nature conservation authorities being aware of the problem.